Last week’s blog was dedicated to the release of new data in the 2018 Out of Reach report from the National Low Income Housing Coalition. 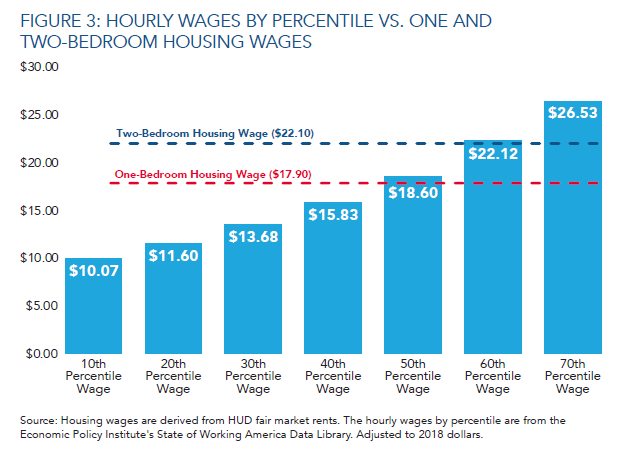 The premise of the Out of Reach report is simple: there is a growing gap between wages and the cost of rental housing in the United States. Last week’s blog discussed the need for more housing assistance, including from the private sector to decrease housing costs and close the gap. This week’s blog takes on the second part of the Out of Reach Report: the problem of low wages, the growth of low wage work and need to address wages in addition to housing to close the gap.  According to the 2018 Out of Reach report from the National Low Income Housing Coalition, a minimum-wage worker would have to work 104 hours per week (up from 96 hours in 2017) to afford rent and utilities for a modest two-bedroom apartment in Mecklenburg County. The report shows that across the United States “wages grew 3.7% from 2016 to 2017 for the lowest 10% of wage earners, due in part to improvements in the economy and state minimum wage increases.” The hourly wage for workers in the 10th percentile is $10.07.  According to data from the North Carolina Department of Commerce under contract with the Bureau of Labor Statistics, there is an estimated 142,470 people in jobs within Mecklenburg County that pay a median hourly wage of $10.07 or less. Some of these jobs include cooks, food prep and service workers, cashiers, and home health aides. Despite wage increases nationally, wages remain too low for many workers to afford fair market rent. 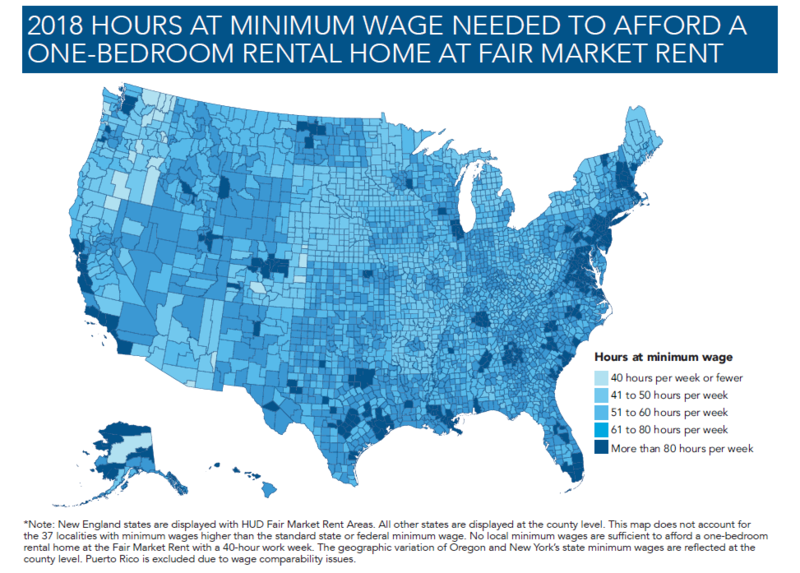 Workers in Mecklenburg County must earn $18.60 per hour to afford a two-bedroom unit at fair market rent to not pay more than 30 percent of their gross income on housing expenses. Seven of the ten occupations projected to enjoy the greatest growth during the next decade, provide a median wage that is lower than the two-bedroom or one-bedroom Housing Wage. So, this means that there will be more low wage earners in need of affordable housing. Most of those jobs are in the service sector, including medical assistants, home health aides and janitors. The Bureau of Labor Statistics (2018) projects an increase of more than 770,000 personal care aides which has a median hourly wage of $11.32 between 2016 and 2026, representing the greatest growth of any occupation. The 2018 Out of Reach report shows that growing wage inequality is nothing new; it has been a long-term trend. A worker at the 95th percentile of the wage distribution earns an hourly wage more than six times that of a worker at the 10th percentile. Despite overall wage growth in the last year, employment gains for workers at the 95th percentile have been more substantial than those at the 10th percentile. In fact, between 1979 and 2016, real hourly wages increased 51.7% for workers at the 95th percentile of wages and only 4.4% for workers at the 10th percentile. The combination of low wages and wage inequality and a shortage of affordable housing contribute to the growing gap in housing affordability. The preface of the 2018 Out of Reach report calls for raising the minimum wage to at least $15 an hour. A link to all minimum wages in the United States by state is available here. Looking at the local level, a recent study by economists offers a different take: upgrade low-wage jobs into better, higher-paying jobs. Researchers from the Federal Reserve Bank of New York and the University of Maine examined the extent to which low-wage workers in the United States transition to better jobs, and explores the factors associated with positive job transitions. Desirability of the work week: how close is the average number of hours worked to 40 per week? In addition to local employers, how can other public and private entities collaborate, coordinate and partner to upgrade low-wage jobs?